Are you signed up for my Illustrators Newsletter? It is a list of five things that I think are worth sharing- books, articles, podcasts, interesting links, straight to your inbox. When you sign up you also get these free resources, and will be making lots more this year, so watch this space. Just sign up at the bottom of this page. It’s free. Unsubscribe whenever you want. I made a list of my Top Tips for Sketchbooking to tuck into the back of your sketchbook. There are ideas to help improve your location drawing, and tricks to beat perfectionism. Are you planning to write and illustrate a picture book? 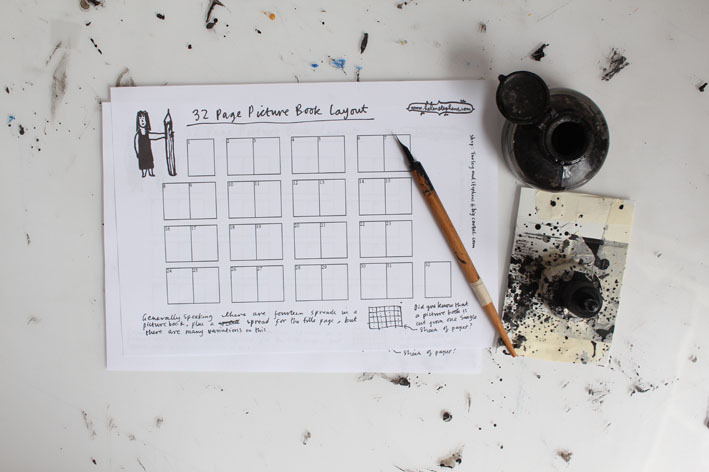 One of the best ways to plan your book is to make a storyboard. This is a downloadable template which you can print out many times and scribble your story into shape. ... or for those who already do. I've made a list of books packed with advice on everything from finding your own voice, to getting published. ... that we have collected and enjoyed with our daughter over the years. Some old favourites, some exciting new discoveries.